Above: Fort Adams was built to protect this important harbor and naval base. Above: The Old Stone Mill was probably built by English colonists in the 17th century but some have speculated that it was built by the Vikings or by pre-Colombian Chinese explorers. 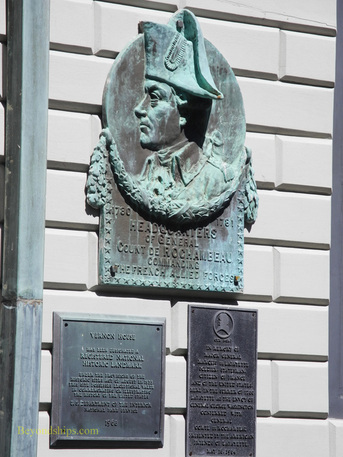 Above: A plaque memorializing the stay of the Comte de Rochambeau in Newport. Rochambeau led the French army that assisted the American colonists in their fight for independence. 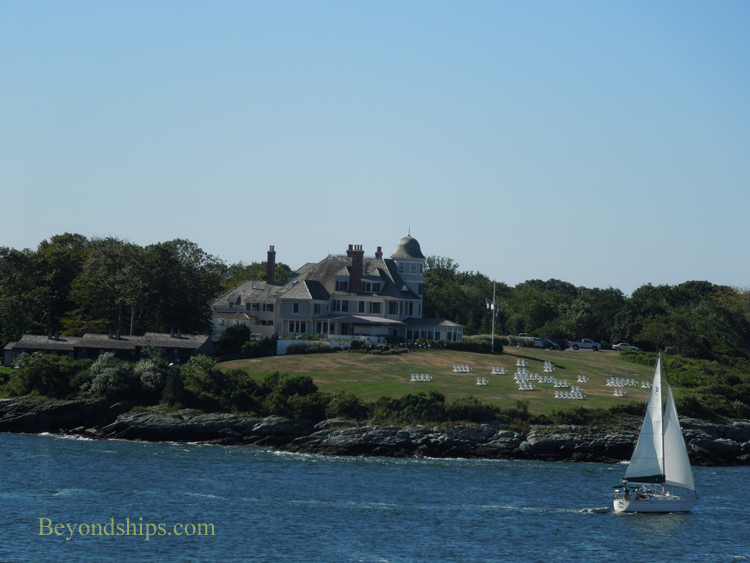 As your cruise ship enters and exits Narragansett Bay, it will pass a number of the Newport "cottages." 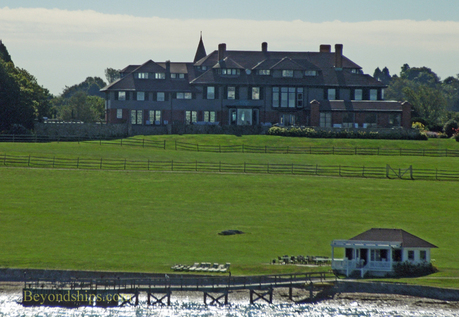 For example, above is Hammersmith Farm (1887), a childhood home of Jacqueline Kennedy Onasis and where the wedding reception was held after she married John F. Kennedy. It also served as the "Summer White House" on occasion during President Kennedy's administration. 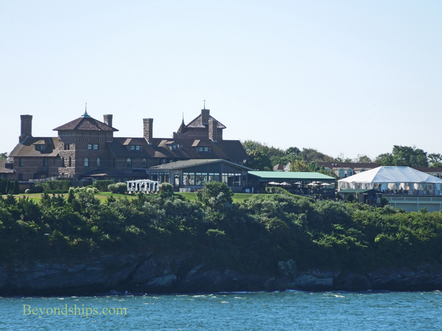 Shamrock Cliff (below) was built for steel magnate G.M. Hutton in 1894 as a summer home. It is now the Ocean Cliff hotel. Castle Hill (above) was built in 1874 for scientist Alexander Agassiz. It too is now a hotel. From the cruise ship anchorage you can see several more mansions adjacent to Newport harbor including Beacon Rock (below), which was once the home of Felix De Weldon, the sculptor best known for his statue of the Marines raising the flag on Mount Suribachi in Iwo Jima. Going back some 5,000 years before the first European settlers arrived, Native American people lived in the Newport area. They cleared the land and, establishing a pattern that continues to this day, spent their summers there. The first European settlers came seeking religious freedom. Anne Hutchinson had been banished from Massachusetts because she objected to that colony's rigid Puritanism. 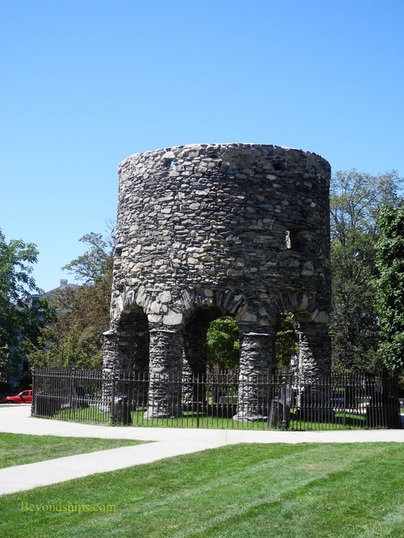 On the advice of Roger Williams, who had been driven from Massachusetts for similar reasons and who had founded the settlement of Providence, Hutchinson led a group of like-minded individuals to the vicinity of Newport in 1638 and purchased the area from the Native Americans. A year later, part of her group split off established the community that would become Newport. In 1641, the policy of religious freedom upon which the settlement was established was codified in the Newport Town Statues. This policy led many people who had been persecuted elsewhere to come to Newport. In particular, substantial numbers of Quakers and Jews came to Newport. Largely as a result of their industry, Newport quickly became the primary port in Rhode Island and one of the five most important ports in colonial America after New York, Boston, Philadelphia and Charleston. By 1741, Newport had become the capital of the Rhode Island colony. Not all of Newport's maritime commerce was above board. In the late 17th and early 18th century, the city was a center of piracy. This was finally curtailed in the 1720s when colonial leaders hung many of the pirates. A business that proved much harder to stop was the slave trade. Despite laws making it illegal, some merchants continued to be involved in the slave trade even after the American Revolution. During the years leading up to the Revolution, Newport was a center of opposition to the British crown. Because of that and because of the strategic value of its port as a naval base, the British occupied Newport from 1776 until 1779. About half the population of the city fled. In addition, the American Army besieged Newport for much of this period. This caused the occupying forces to tear down houses and other structures to use for fuel. After the British left, a French army under the Comte de Rochambeau used Newport as its base. George Washington met with Rochambeau here and it is believed they developed a strategy for concluding the war. The war, however, devastated Newport. Many of its people had left never to return. Its buildings were damaged and there had been no trade. Newport never re-gained its prominence as a commercial center. Toward the middle of the 19th century, Newport found a new role. The development of the steamship and the railroad made Newport more accessible to the rest of the country. Wealthy people were anxious to escape the heat of the summer in the urban centers of the North and the plantations of the South. Since industrialization had bypassed Newport and because of its attractive location by the sea, Newport became the nation's resort capital. The wealthy summer visitors began to build houses on the outskirts of town for their use during their yearly stays in Newport, which they called "cottages." Soon, it became a competition to see who could build the biggest and most opulent mansion. The resulting structures were architectural masterpieces, many of which have been preserved. Life in the mansions was governed by a rigid set of unwritten rules. There was also a hierarchy in this society in which some members of the elite were more equal than others. 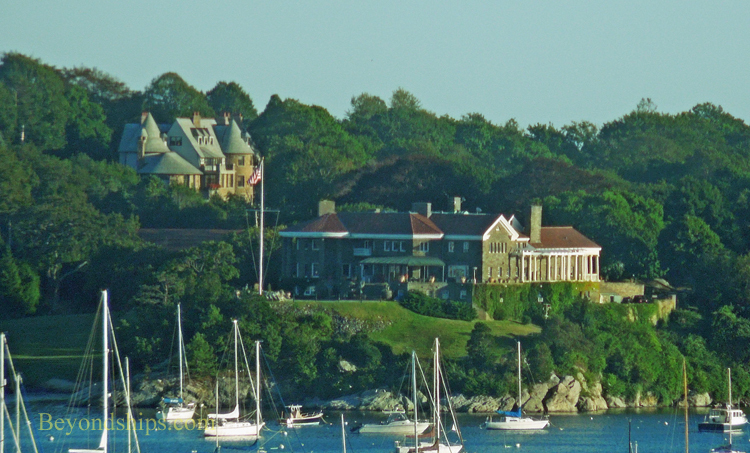 While some of the mansions have been opened to the public as museums or converted to other uses and the rules of society have relaxed over the years, Newport continues to be a home for the wealthy. Newport has also long been a home to the United States Navy. Its activity in Newport reached its peak during World War II but it continued to be a base for a portion of the Atlantic fleet until 1973. The Navy still has a base in Newport but its focus is education and training. The departure of the fleet had a significant impact on the economy of Newport. However, efforts to revitalize downtown and the waterfront area as well as efforts to preserve the city's colonial buildings and Gilded Age mansions have made Newport a center for tourism.